In response to Norway’s decision to divest of coal-company stocks, some people detected an odor of hypocrisy, given off by Norway’s continued dependence on another fossil fuel: North Sea oil. To which I say, Enh. Any step in the right direction is welcome. –The oil industry is going through one of its chronic contractions. HOUSTON – Pelted by the oil-market crash, the energy industry’s job cuts reached 150,000 by the end of May, says energy recruiting firm Swift Worldwide Resources, and that figure had grown by a fifth since March. 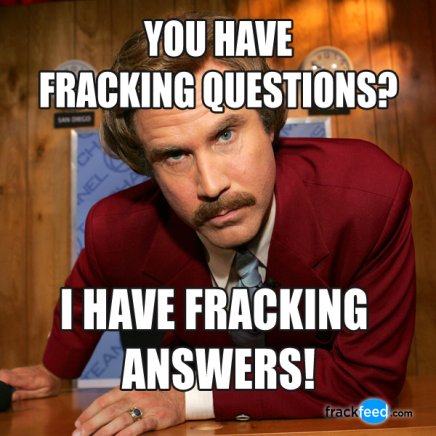 –The fracking industry acknowledges its image problems by launching a cute PR campaign. (How dumb do they think we are? We’ll see .. . .) I really want answers from a fake newscaster. 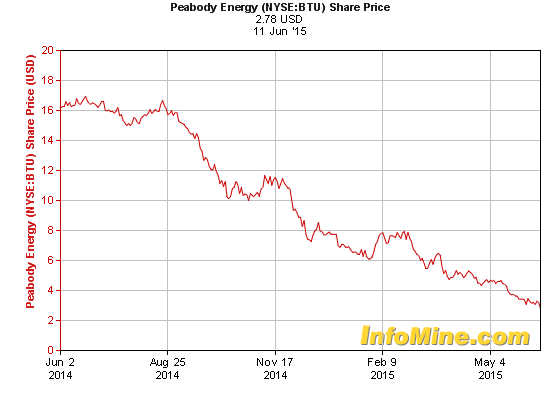 –If you are keeping track, here is a chart showing the value of a share of stock in Peabody Energy, one of the largest coal companies in the U.S. (Fun fact: the NYSE ticker symbol is BTU — i.e., British Thermal Units). To summarize, a share that was worth $16 a year ago is now worth $3. That in itself is a reason to divest.